Home > News from Vermont > News from Vermont #404 From One Generation To The Next ….It’s All So Sweet! Posted by Sara Garland | Jan 08, 2019 | Comments Off on News from Vermont #404 From One Generation To The Next ….It’s All So Sweet! “Just tell him I died. Maybe that’ll work.” That’s what I said to my son Tom the other day. Sound rather drastic? Well folks, our situation is rather challenging. You see here on our farm where seasons come and go, we’re faced with a human “season”, so to speak. This I write as the seventy-year-old that I am, one who neither expects to live or work forever. Tommy sharing his 8th generation sugar making knowledge to some lucky tourists! I’ve been the main tour guide here at our farm for a long time. During those years I’ve been able to “hone my act” so that, in addition to explaining the maple sugaring process, I’m able to deliver a few funny jabs and punch lines. Hence, with a relative degree of certainly, I’m assuming the laughter I hear is “with” me, not “at” me! And, I’ll assure you good folks that it has not always been that way. Years ago my father Harry Morse, Sr. provided the “maple entertainment” at our farm and I was just a grunt worker behind the scenes. The few times he needed a break and I stepped in, at the very least I stuttered and stammered through my weak presentation. At the worst, I’d hear boos and hisses. On those occasions, I’d always walk away wounded. I knew, however, that there’d be a time when Dad would have to slow down or drop out completely and I’d best learn how to do a more acceptable job. It’s been almost 20 years now since Dad passed away and, by the grace of God, those 20 years have not only allowed me to hone my act but have brought on another “full circle”; my son Tom now finds himself in a situation similar to my own way back then. The other day, he took over for me in the sugarhouse and a group leader from a bus tour nearly had a fit because “Burr was not talking to his group”. 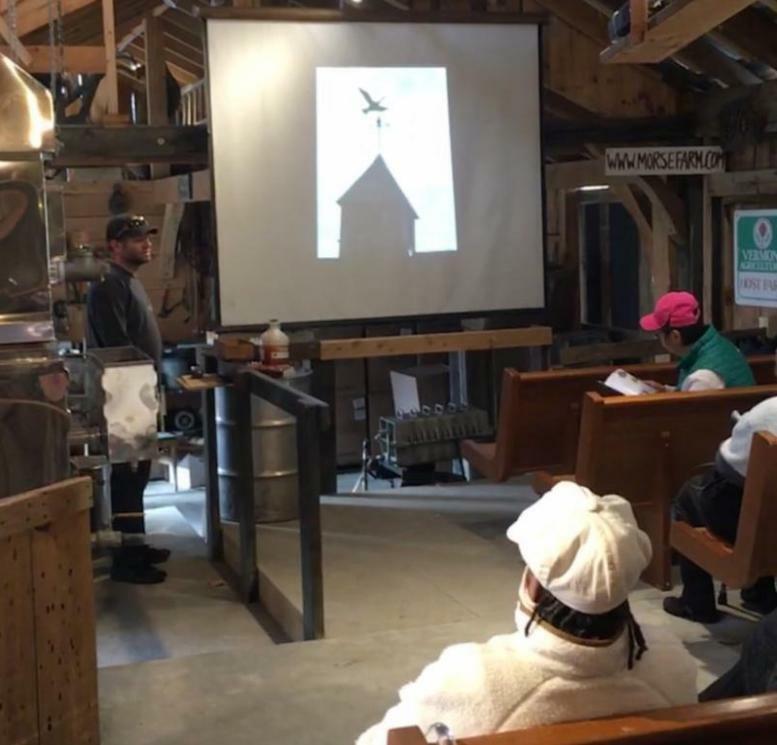 And, I will add, Tom does a great job with his sugarhouse presentation, much better than I did all those years ago. Hence, my opening statement about “telling him I had died”…I have little patience with anyone who fails to understand our need to transition. And speaking of my own demise, I did read my own obituary once. Yes, back in the year 2000 as I scanned the section for 1971 grads in the University of Vermont Alumni Magazine, low and behold, there I was: “Harry Morse, Jr. (that’s me), class of 1971, died April 20, 1999”. After gathering myself, I looked down again at the rag in my now ghostly white hands to re-read. Sure enough, they had me deader’n a doornail! It seems someone had falsely reported to them that my father’s death on that day, Harry Morse Sr., was actually me! Yup, I plan on making it burn “as brightly as possible” while I’m able to but just like my beloved maple sugaring, everything has a season. Reach for that torch, Tom and carry it with pride.